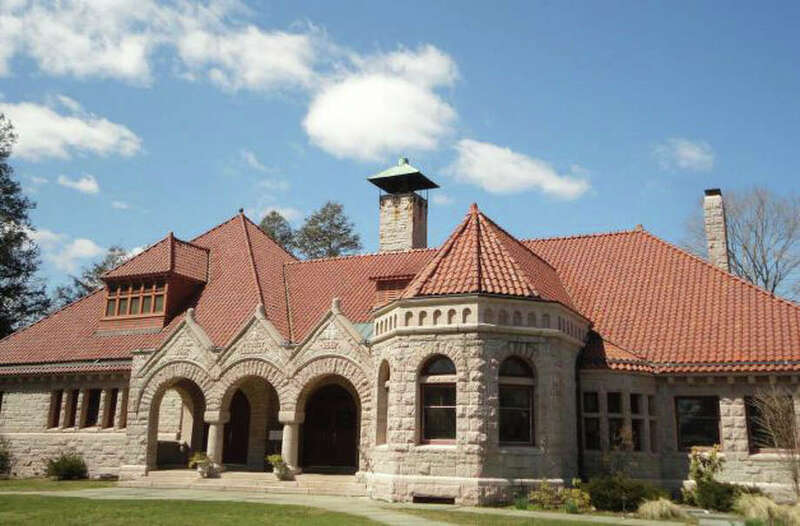 The Pequot LIbrary faced a budgetary battle when the Board of Finance voted to elminate entirely the town's $350,000 annual contribution. The funding was restored by the Representative Town Meeting. With 2013 drawing to a close, it's time to look back and take stock of the top news stories in Fairfield over the last 12 months. It was, in significant ways, a year that was quieter than the preceding one, what with the unforgettable havoc wreaked on Fairfield and many communities by Superstorm Sandy in October 2012 and the nearby tragedy at Sandy Hook Elementary School when 26 people were massacred Dec. 14, 2012. Nonetheless, 2013 had its share of notable local events, ranging from a paralyzing winter blizzard to a wandering seaside concession stand to wrangling over voting districts that remains unresolved to potential local tragedies that were averted. SNOW DAZED: No one was complaining about a lack of snow when a blizzard walloped the town Feb. 8, dumping 35 inches in a 24-hour period. There were no fatalities or serious injuries caused by the storm, and after a flurry of accidents during the storm's first hours that Friday, emergency call volume was slow. Clearing the streets from the largest snowfall to sock the town in years took DPW crews several days, requiring deployment of payloaders to clear the snow and truck it, when necessary, to the parking lot at Jennings Beach to melt down weeks later. By Saturday morning, half of the town's main roads were clear, and town offices were open for business as usual by Monday. PEQUOT FUNDING FIGHT: A proposal by former Board of Finance Chairman Robert Bellitto Jr. prompted the panel to entirely eliminate a $350,000 town contribution to the Pequot Library in April during deliberations on the 2013-14 budget, triggering a firestorm of criticism from both sides of the political aisle and the library's supporters. A rally was held and lawn signs could be found around town voicing support for restoration of the funding, which the Representative Town Meeting agreed to do April 22. Officials of the privately run library in Southport warned that without the town financial support, the library might have closed its doors. BEACH STAND'S ODYSSEY: After Superstorm Sandy swept the concession stand at Southport Beach off its foundation and across Pequot Avenue in October 2012, the long, strange odyssey of the former King's Kitchen began. When town officials decided not to repair the small, wooden structure, the concession's operator, Hunter King, purchased it for $450. The one caveat was that the structure was to be removed from the beach by the end of June. But it wasn't. The stand sat there until the town threatened to demolish if it was not gone by Aug. 12. That prompted King to move the shack, hauling it first to a private home on Beachside Avenue in Westport, then to Westport's Burying Hill Beach, on to the state commuter parking lot on the Sherwood Island Connector and last a site off Nyala Farms Road before landing back in Fairfield at the parking lot of the Ukrainian Club, which, like the earlier property owners, had not given King permission. Since then, its whereabouts were a mystery until it was spotted in December at Rogers Septic Tanks on the Post Road East in Westport -- still without a permanent home. MILL RIVER CLEANUP CLEARED: For years, local and state environmental officials wrangled with the owners of the former Exide Battery factory -- and each other -- over removing lead-contaminated sediment from the Mill River, which had been deposited there by decades of manufacturing at the Post Road plant. Exide is under a longstanding order from the state Department of Energy and Environmental Protection to clean it up. In August, all parties reached an agreement on Exide Group Inc.'s application to dredge 27,600 cubic yards of sediment from the river. The town's Conservation Harbor Management and Shellfish commissions, along with the group Fairfielders Protecting Land and Neighborhoods, had filed an intervention over the application to ensure Exide would clean up the lead pollution in accordance with certain standards. But on Aug. 6, FairPLAN announced that it was following the town's lead and withdrawing its intervention, allowing the river cleanup process to finally move forward. HAZMAT EMERGENCY: On Oct. 7, fire and police officials could be seen quickly leaving a emergency-services awards ceremony after being alerted that a large collection of weapons, chemicals and explosive materials had been found at the Bronson Road home of 69-year-old Joseph Callahan. The discovery triggered a days-long hazmat response and cleanup, while charges of illegal possession of explosives, manufacturing bombs and reckless endangerment were lodged against Callahan, who said he was making a bomb for Rolling Stone Keith Richards, in case he ever ran into him. After the guns, weapons and ammunition was removed, Callahan hired a private firm to remediate the property. ROCKY RUN-UP TO ELECTION: With no first selectman race on the ballot in November's municipal election, it was a relatively quiet campaign season, save for the sniping over campaign signs shaped like stop signs, tension in the Registrar of Voters Office between the two registrars, and the still-unsettled argument over redrawing the boundaries for the town's voting districts. Recounts were needed in two Representative Town Meeting districts because of slim margins between the candidates, but in the end, Republicans added to their majority seats, increasing their margin on the 50-member legislative body from 28 to 34. The GOP also retained its majorities on the Town Plan and Zoning Commission and the Board of Finance. Where residents would cast their ballots remained up in the air for most of the year, when the RTM committee charged with devising a local redistricting plan failed to reach agreement. That prompted three Republican members of that committee to bring their own plan to the RTM, one that reduced the districts from 10 to eight. Democrats opposed the plan, and challenged it before a Bridgeport Superior Court judge, who ruled in July the RTM violated its own rules and town ordinances by adopting the plan. That meant districts remained unchanged for the November elections. Tension between the two registrars of voters boiled over just weeks before the Nov. 5 election when Republican Roger Autuori was accused of slapping his Democratic counterpart, Matthew Waggner. Autuori, 61, was charged with breach of peace and the two now operate out of separate offices in Old Town Hall. The incident happened when the two were preparing voting equipment for the balloting. A YEAR WITHOUT PENFIELD: More than a year after Superstorm Sandy inflicted severe damage on the Penfield Pavilion, forcing the facility to close its doors for all of 2013, the shoreline structure is expected to remain closed next year as well. Town officials learned at the beginning of the year that repairs to the pavilion would entail much more than first believed. With some residents expressing frustration that the pavilion had not reopened, an August public meeting was held to discuss three options for Penfield's future. Residents offered other ideas, including not rebuilding the pavilion at all, rebuilding a simpler, smaller structure or moving it to Jennings Beach. At its November meeting, the RTM approved nine members of the Penfield Building Committee who had been recommended by the selectmen, and meetings to decide Penfield's repairs are scheduled to start in January. TROUBLING URGES: On Nov. 26, when Longview Avenue resident Joseph Russo, 44, was released from St. Vincent's Medical Center in Bridgeport, police were waiting for him with an arrest warrant that charged him with first-degree threatening and threatening an act of terrorism. Russo had been at the hospital for a month-long emergency committal after calling police Oct. 27 and telling them "disturbing details of his intent to harm students" at Sherman School, including possible hostage-taking. It was not known why Russo targeted the school. He has no children and did not own any weapons, police said. NEW CORPORATE CITIZEN: The town scored a coup on Dec. 9 when Save the Children, the international relief agency headquartered in neighboring Westport for four decades, announced it plans to move to Fairfield. The children's relief agency plans to lease about 60,000 square feet of space in a building at 501 Kings Highway East, which also houses the town Board of Education offices. The agency will bring with it about 300 employees from Westport. GUN TRAGEDY AVERTED? : With many bracing for the one-year anniversary of the Sandy Hook Elementary School shootings, a Stratfield Road neighborhood found itself the center of similar attention on Dec. 4 after William Dong, 22, was spotted on the campus of the University of New Haven with loaded handguns and an assault rifle, according to police. Dong lives with his family on Stratfield Road, just a few doors down from the former Stratfield Market, and had graduated from Fairfield Warde High School in 2009. With Dong in custody, a large police contingent waited outside the house for a search warrant. In his padlocked bedroom, police said they found 2,700 rounds of ammunition and newspaper clippings about the mass shooting in an Aurora, Colo., movie theater last year. Dong remains in custody and his case has been continued to Jan. 14.